Saturday at the market there were only two boxes of local Roma tomatoes. Last of the season, they told me. On the first day, I made sauce. On the second day, I trimmed and halved tomatoes for freezing. And on the third day, inspired by Emmy, I made my way to the bottom of that 25-pound box by roasting them. 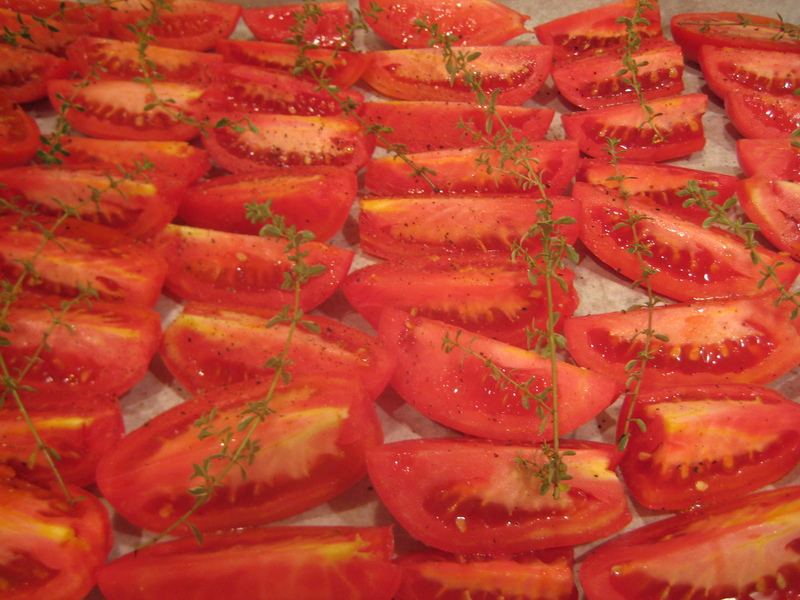 Quartered tomatoes, roasted low and slow at 275º, drizzled with olive oil, sprinkled with a bit of salt and pepper and strewn with sprigs of thyme. Two and a half hours in the oven and the house was fragrant, the tomatoes sticky and the flavour intense. when the snow flies outside. I read a couple of your blogs and time restraint made me scroll through a few more. Your presentation skill in the photos is inspiring. Job well done. The tomatoes on the tray pic made my mouth water. I will drop back and read more when time allows. Thank you, Richard! I look forward to seeing your next video! I’ll mention your cooking show on my blog one of these days. I’m thinking of adding a feature on recipes/ideas etc. that have caught my attention. It’s a great way to share ideas and resources with others. 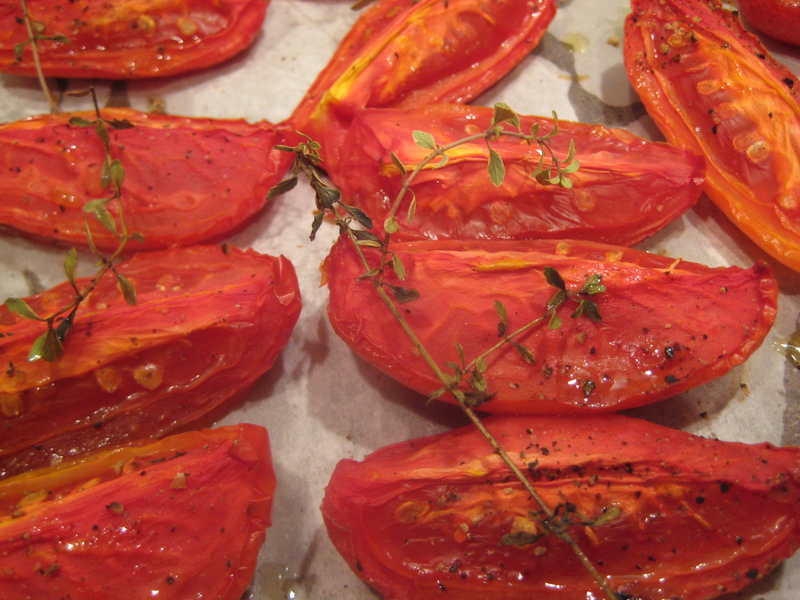 Slow roasting gives the tomatoes such a wonderful flavor. We will all be enjoying summer tomatoes in the middle of winter with a smile on our face. Yes, smiling indeed. It gives me such a good feeling to see everything I’ve put into the freezer so far, and I just started a few weeks ago. I’m curious to see if I can make it through the whole winter without buying any tomatoes; they’re what I use most in the kitchen, next to onions. Excellent and don;t they look good! The colour is so vibrant and appealing. I’ve been filling my freezer with all sorts of tomato preparations for winter. When I open the door, all I see is red, and I mean that in a good way! What would the world be without tomatoes? The farmers market still had plenty of tomatoes on Saturday. I think I’ll be roasting tomatoes next weekend. Thanks, Mar! Enjoy the tomato roasting! I’ve never frozen them before, but this is what Emmy over at Emmy Cooks does, and I’ve never gone wrong following her advice.